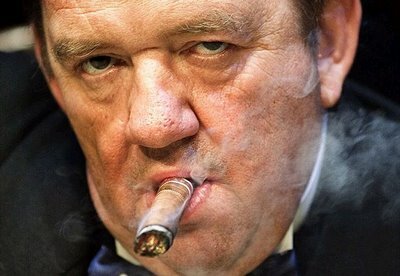 The rather magnificent British commedian Mel Smith (above) appeared this week in the Edinburgh fringe as one of history's most recognisable personalities - the British war leader Winston Churchill. 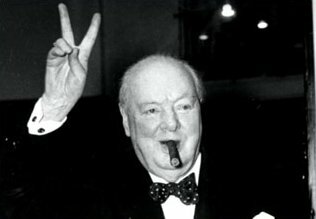 Churchill, who was not too long ago voted as the Best Brit in a BBC poll, is famed for his bullish looks of determination and resolve, and also his constant cigar smoking. Unfortunately, it is the last of these characteristics that has caused a bit of a storm, as Scotland has recently banned smoking in public places. The Edinburgh council, with not unusually characteristic self righteousness, immediately announced that if Mel was to smoke on the stage at the Fringe, not only would the play be immediately cancelled, but also the licensor would not be able to get a license at any subsequent Fringe event. Possibly a little over reacting? Or possibly just fair play all round? The arguments have been flying both ways since and there is nothing the Fringe loves more than a bit of a philosophical/political argument. "It would have delighted Adolf Hitler. Adolf Hitler, as you know, was anti-smoking. You couldn't smoke at Adolf Hitler's dining table, so he'd be pleased, wouldn't he? Congratulations Scotland." Maybe a slight over reaction on both camps then? The Guardian sums it up nicely. Infernal Spares: Has Hollywood Run Out of Ideas?